While it is not as addictive as heroin or cocaine, MDMA can cause other adverse effects including nausea, hallucinations, chills, sweating, increases in body temperature, tremors, involuntary teeth clenching, muscle cramping, and blurred vision. MDMA users also report after-effects of anxiety, paranoia, and depression. An MDMA overdose is characterized by high blood pressure, faintness, panic attacks, and, in more severe cases, loss of consciousness, seizures, and a drastic rise in body temperature. MDMA overdoses can be fatal, as they may result in heart failure or extreme heat stroke. The effects start after about 20 minutes and can last for hours. These is a 'rush' feeling followed by a feeling of calm and a sense of well being to those around, often with a heightened perception of colour and sound. Some people actually feel sick and experience a stiffening up of arms, legs and particularly the jaw along with seensations of thirst, sleeplessness, depression and paranoia. Gives a feeling of energy. Some mild hallucinogenic effects. 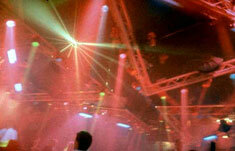 Many problems users encounter with Ecstasy are similar to those found with the use of amphetamines and cocaine. They include increases in heart rate and blood pressure, nausea, blurred vision, faintness, chills, sweating, and such psychological problems as confusion, depression, sleep problems, craving, severe anxiety, paranoia, and psychotic episodes. Ecstasy's chemical cousin, MDA, destroys cells that produce serotonin in the brain. These cells play a direct roll in regulating aggression, mood, sexual activity, sleep, and sensitivity to pain. Methamphetamine, also similar to Ecstasy, damages brain cells that produce dopamine. Scientists have now shown that Ecstacy not only makes the brain's nerve branches and endings degenerate, but also makes them "regrow, but abnormally - failing to reconnect with some brain areas and connecting elsewhere with the wrong areas. These reconnections may be permanent, resulting in cognitive impairments, changes in emotion, learning, memory, or hormone-like chemical abnormalities. Based on "Clear Body Clear Mind" by L. Ron Hubbard, this picture book describes the detoxification portion of the Narconon program in a simple, easy-to-understand way. The effects of long-term MDMA use are just beginning to undergo scientific analysis. In 1998, the National Institute of Mental Health conducted a study of a small group of habitual MDMA users who were abstaining from use. The study revealed that the abstinent users suffered damage to the neurons in the brain that transmit serotonin, an important biochemical involved in a variety of critical functions including learning, sleep, and integration of emotion. The results of the study indicate that recreational MDMA users may be at risk of developing permanent brain damage that may manifest itself in depression, anxiety, memory loss, and other neuropsychotic disorders.